Look what I got from a FGM in Mo. What a great surprise and she is so beautiful. The color blue with the silver trim is perfect and what a surprise when I opened the box. She is sitting next to my Precious Moments Children’s Nativity set right now, but she will soon be moved to the mail table. Thank you to a thoughtful NY elf for a very nice picture Christmas card!!! Thank you to my kind elf in Fla. thanks so much for the beautiful angel pin and the nice Christmas card. I want to thank a wonderful, sweet elf who surprised me today with an Amazon gift card. I can't wait to spend it on something great!! Thank you so much!!!! OMG I almost forgot to post my THANK You to a very special FL elfette for the beautiful angel pin. I wore her to work today and was afraid to take her off for fear she would disappear. She made a huge hit. I got so many compliments on her. 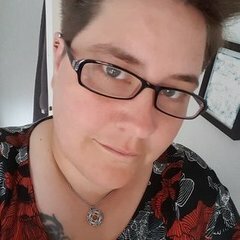 THANK YOU TO MY SWEET FL ANGEL HERSELF! 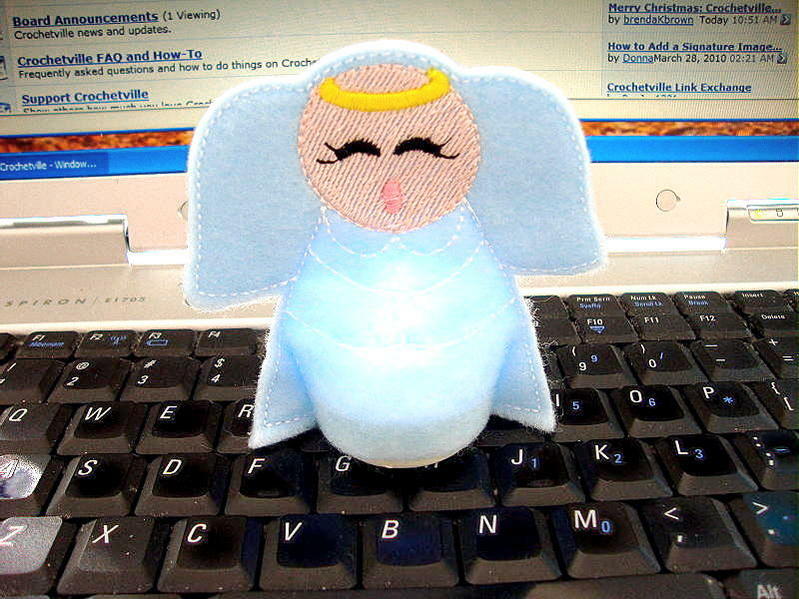 I just love that angel - she is so pretty and perfect for you! 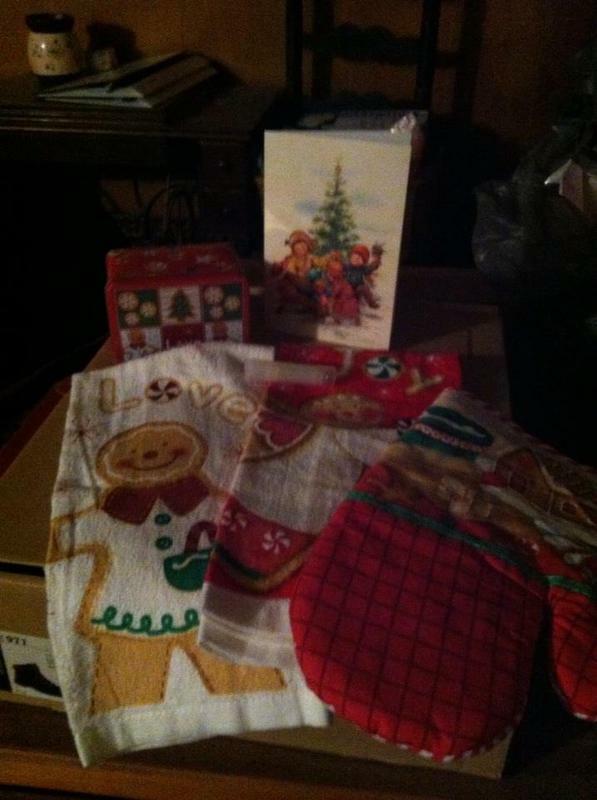 :hugThank you to a fabulous friend/elf in KY for a brilliant surprise with lots of gingerbread joy!! Thank you to a thoughtful PA elf for a beautiful Christmas card. I hope that Santa doesn't add me to his naughty list! I want to say THANK YOU to MY FAIRY GODMOTHER FROM POLAND. I received a wonderful package today that really brightened my spirits. There were some hooks, a hookcase, a pretty pink flower, lipbalm and other wonderful goodies. It's so nice to be thought of, and especially from around the world. It makes my spirit soar, as I fight through the effects of Chemo for breast cancer. It's a long journey ahead of me, but with so much love, I will get through this. Thank you, FGM, for really brightening my day. I have 2 lovely elves to thank. 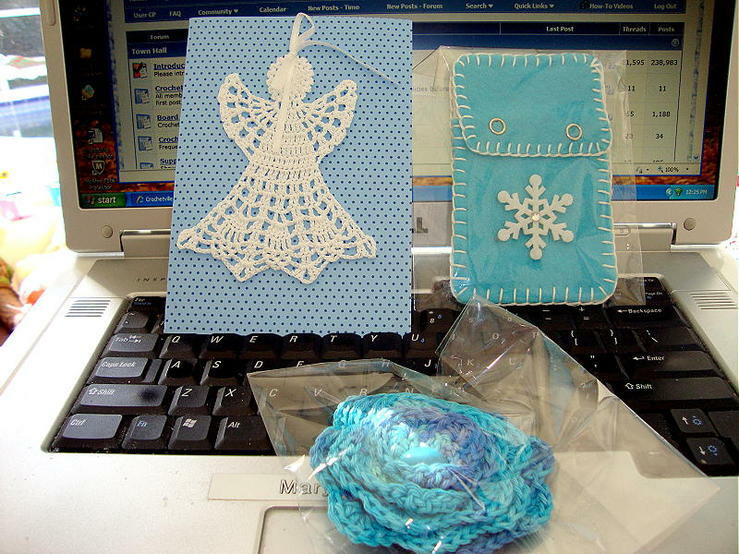 Thank you to an elf in MO for the Christmas card and the beautiful Snowflake. 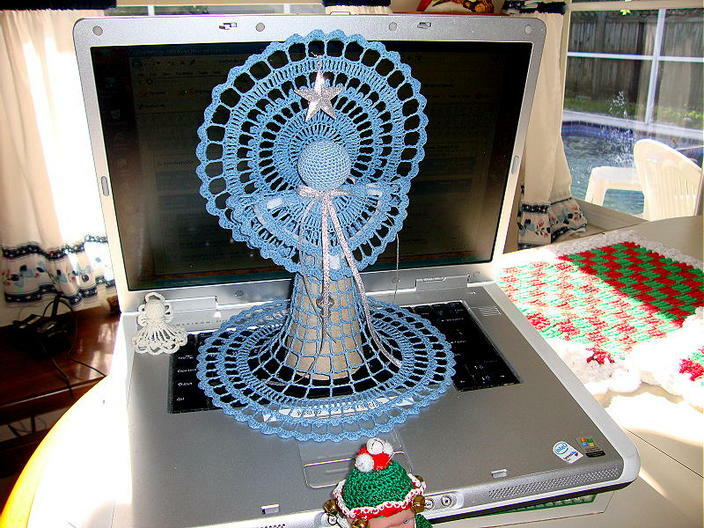 Thank you to an elf in CA for the set of steel hooks for thread crochet and 3 lovely ornaments. I can't add photos because, for some unknown reason, my laptop crashes when I do. Thank you Elfie, in Mo! 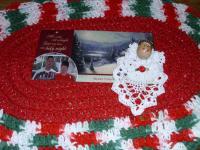 for the most delicatly lovely snowflake i have ever seen, and a very nice Christmas card too! Youda best!!!! A very special Thank You goes to my fairy godmother for the wonderful snowman who is decorated in the colors of breast cancer, Pink! He is so cute! I just love him. And thank you for the pink book marker also. It is perfect for the book I am reading. Thanks for being so nice to me while I'm going through this terrible disease and treatment. I have been a little la with my thank you's. I have three FGM's I must thank. 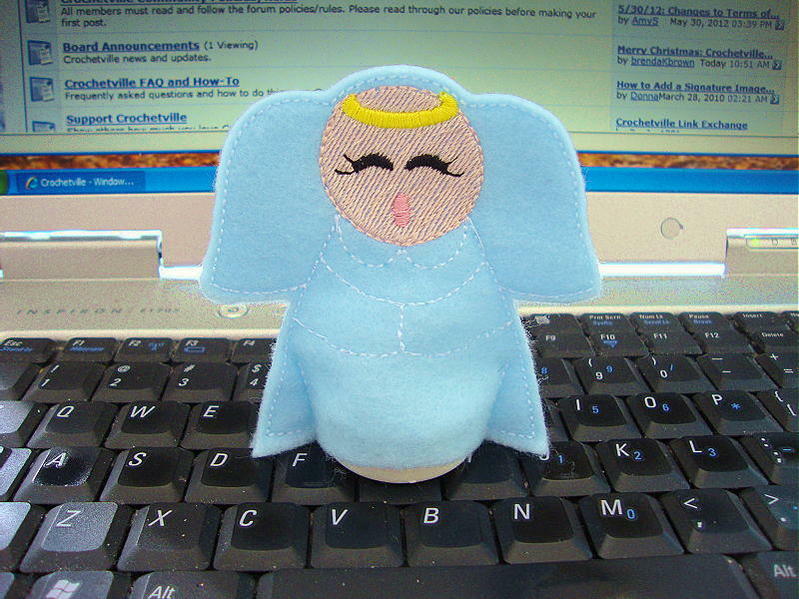 First is from NY who sent me a cute felt Angel with a tea light under her skirt that lights up. 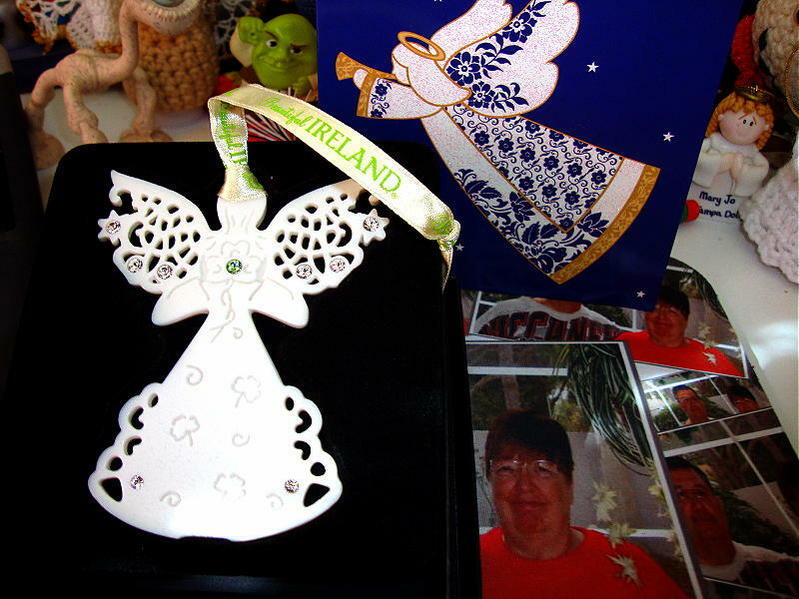 Next is our FGM from Poland who sent me a pretty flower, angel for my tree and a cute case. 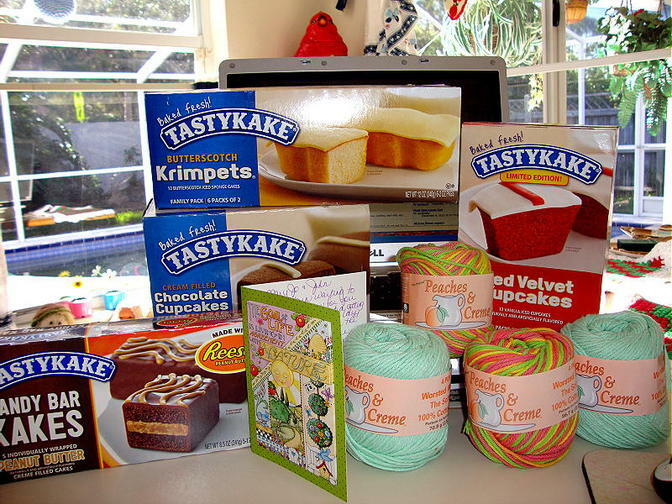 Last but not least a FGM in NJ who sent me TASTYKAKES:cheer and some Peaches and Cream. 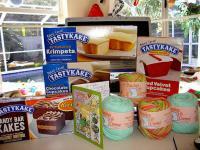 Thank you to all of you for being so generous, and making my day. Today I got another surprise in the mail. 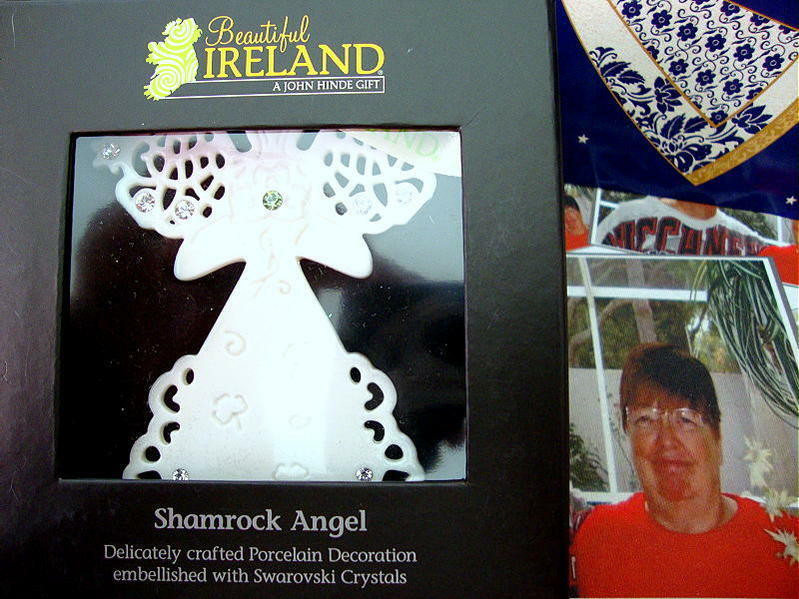 A FGM from Ireland, sent me a beautiful Angel. She is called the Shamrock Angel and I have her hanging next to the heart made from a dress my Mom loved. Thank you FGM for this beautiful angel. I love LOVE love the booties you made & sent for Miss Rosalie!! Our school colors are green (& since my brothers are still in school - they will be perfect for ball games!). 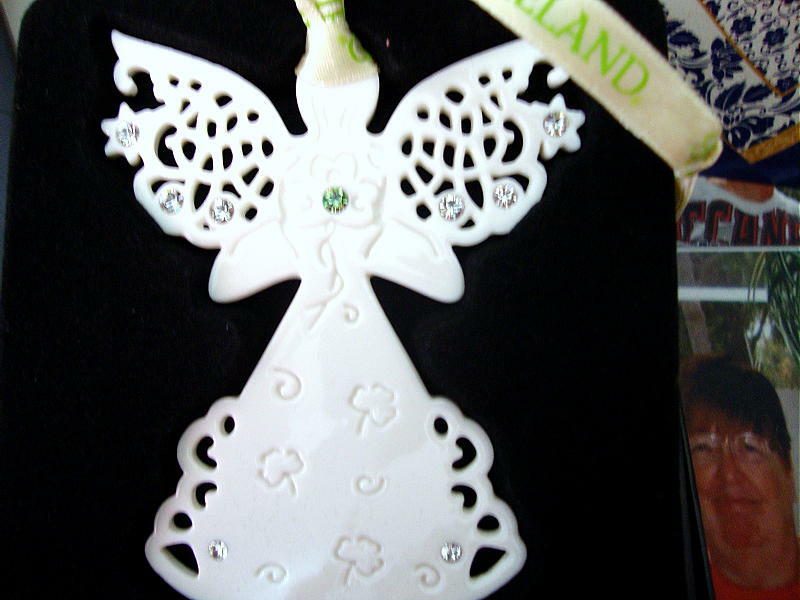 Thank you to a sweet fairy godmother in Poland for my gorgeous angel, snowflakes and stocking. I love them! My computer is not working at the moment so I can't post a photo. 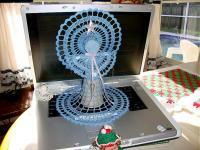 But there is a photo on my newest blog post. Very belated thank you to some elves who sent me Christmas Cards! It was very nice to get them! I love mail!! 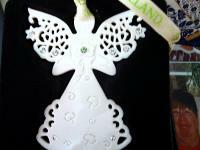 2 days ago I got a wonderful Card witjh lovely glittering snowflake from FGM from Mo. I'm so happy! I love it! 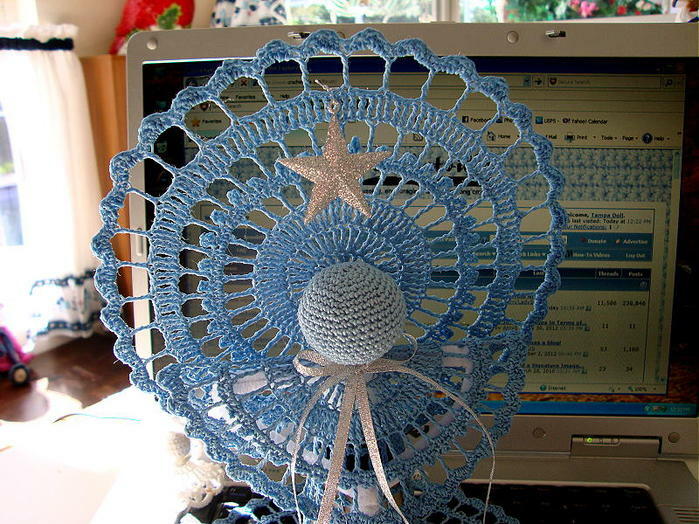 When I saw the snowflake I knew I don't have this pattern so tomorrow I'm going to sit and examine the one I got So pretty! THANK YOU SOOOOO MUCH!!! !